Another little book today. Even though it’s little, it has taken me awhile to get this into my blog. 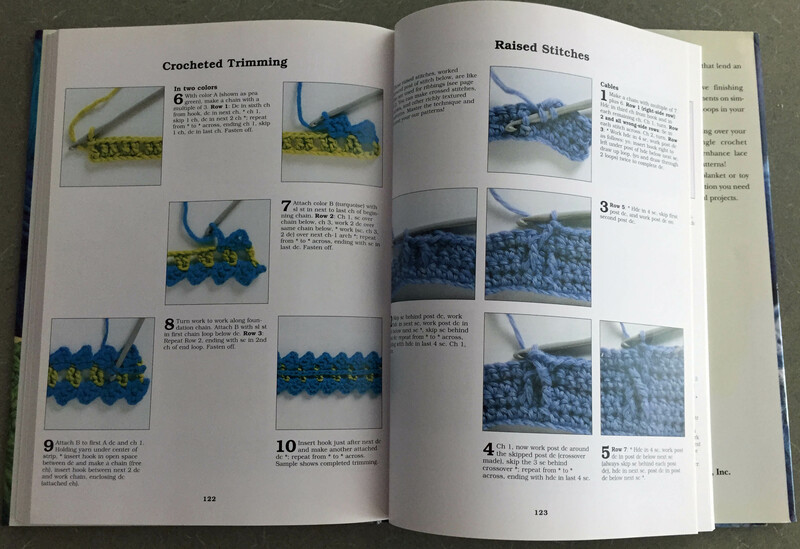 Knitting Pretty by Kris Percival (published in 2002 by Chronicle Books) is an easy to read and easy to use book. I have some negative comments, but generally it’s a nicely done 120 page volume. Thumbs up or down: I liked the top down sweater at the end of the blog post, but most of the patterns are too simple for me. I’m going to pass on this book and keep my shelf space for more important books. 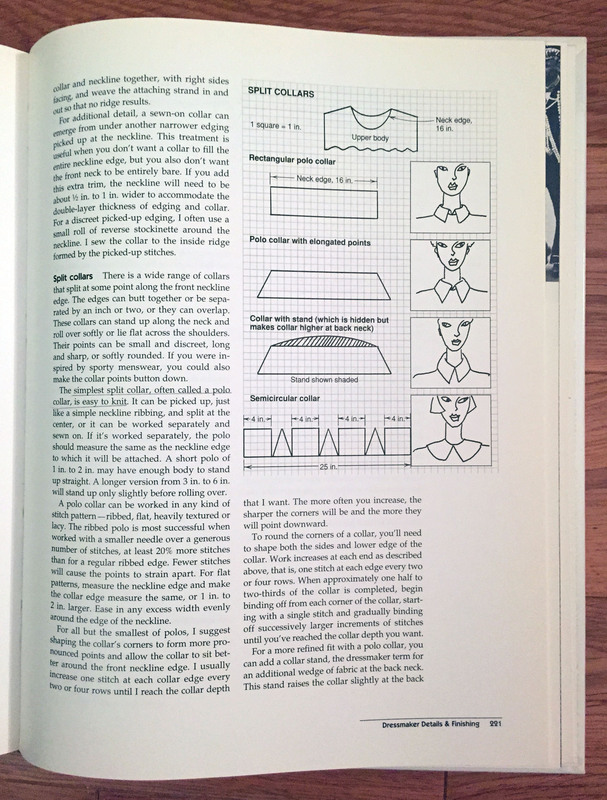 The American Style “How to Knit” page shown in the book has very small illustrations ( all illustrations are similar and all too small). Could you really learn from these illustrations? The next page is the Continental Style with no illustrations – yikees! Plus I wonder if a beginner would get the difference between the two styles and why to choose one over the other. 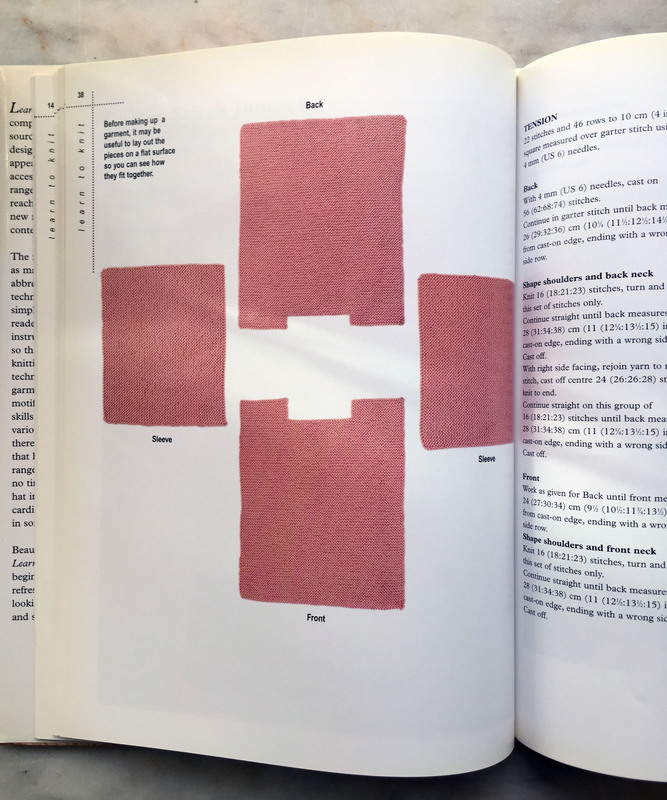 After all the “How-to” pages – through page 40, the first projects were simple and noted by a “1” in a circle. Clever graphics. The instructions tell you what you need to know and what page to refer to for a refresher on the technique – very clever. I like the step-by-step numbered instructions. 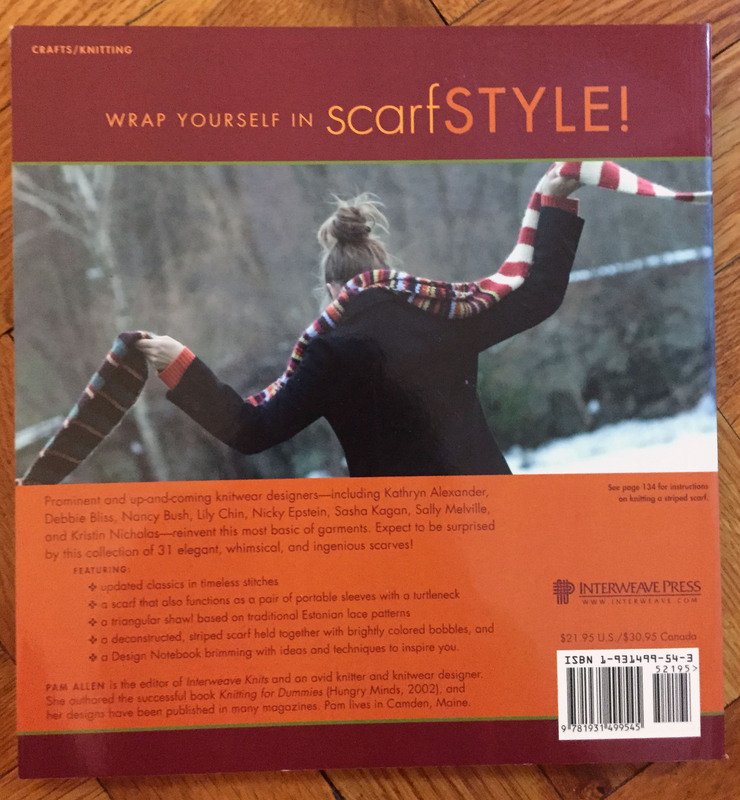 I include this project only because I’ve been working on mittens this winter and looking at various patterns. There isn’t a section which shows how to cast on and join for double-pointed needles. Not the easiest for someone who is using the book as a novice although there are lots of places where one could go to find the technique on the internet. The swatches used to check gauges have other uses. 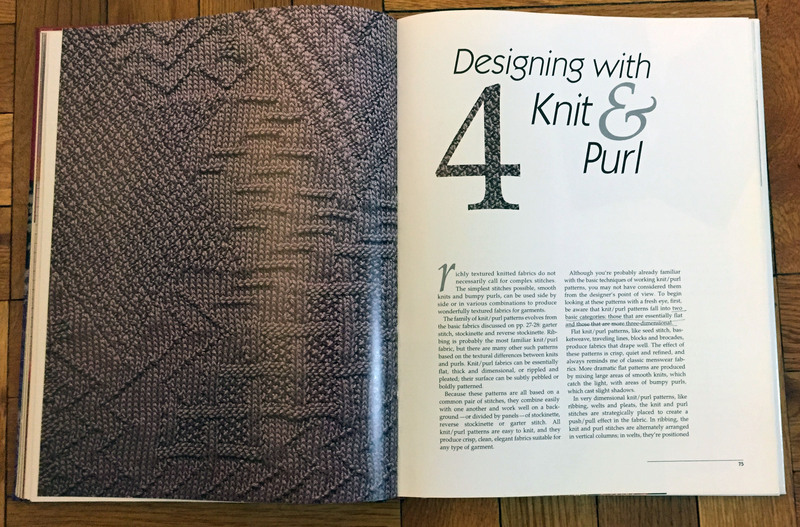 This spread talks about ways to use squares, but the patterns are a bit vague. Knit in the round from the top down, this is a nice sweater. It’s made in a chunky yarn which would make it a faster-to-knit project. 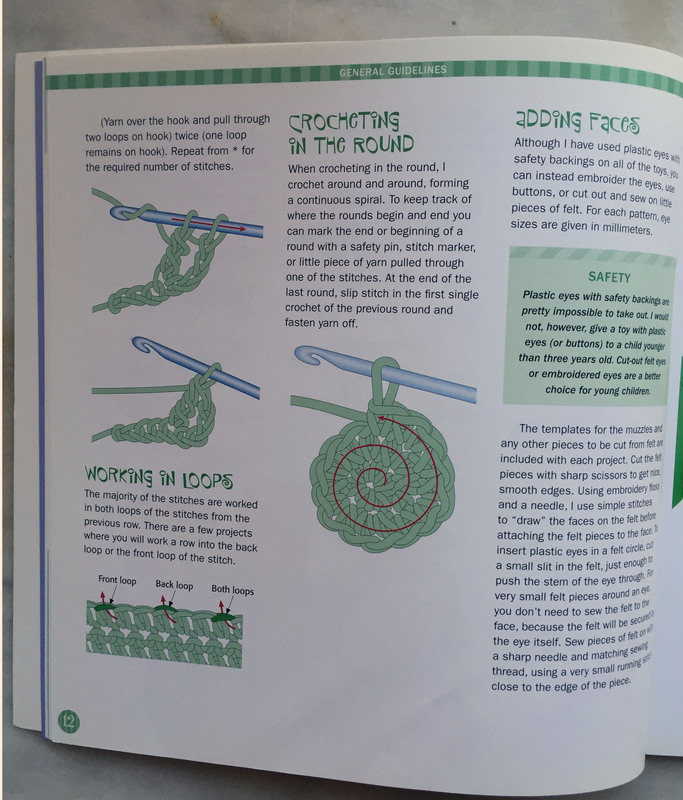 The lack of how to knit with circular needles makes it again a bit of a stretch for a novice. 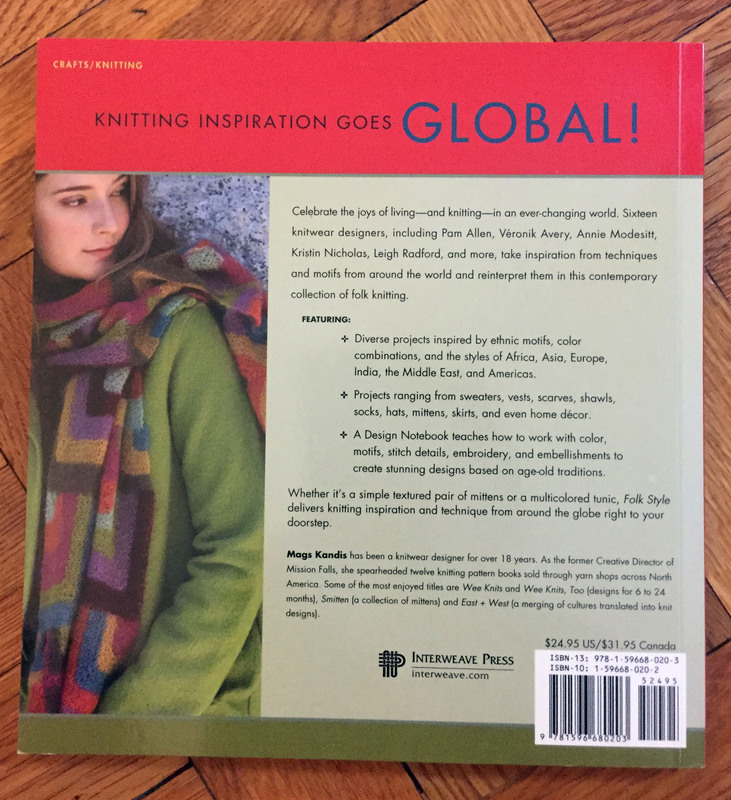 This book is one of a series of books created by owners of the Yarn Company shop in New York City – Julie Carles and Jordana Jacobs. This one was published by Carlson Potter in 2002. Before I start the review, I’ll add a spoiler alert. I’m keeping this book and thus a thumbs up. 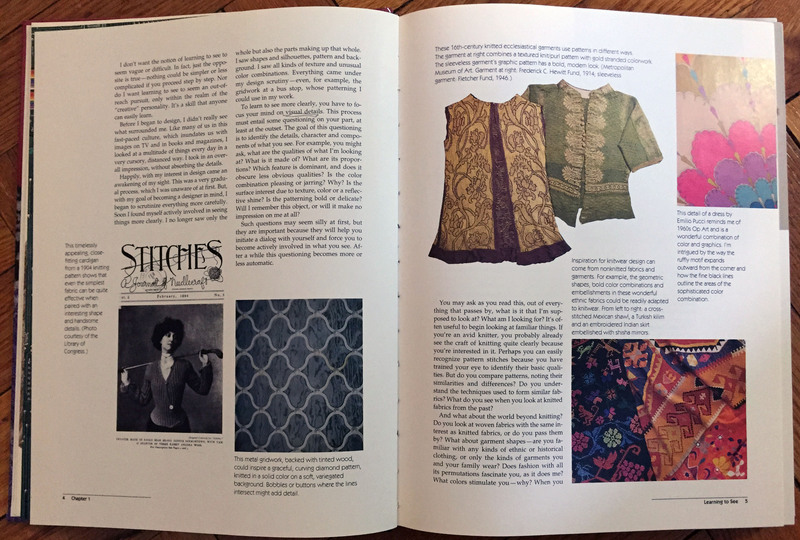 Maybe I’m waffling in my old age or something, but the book does have some interesting designs and I’m almost in the mood to make a sweater. Haven’t done one in a long time. The illustrations are clear and easy to follow. 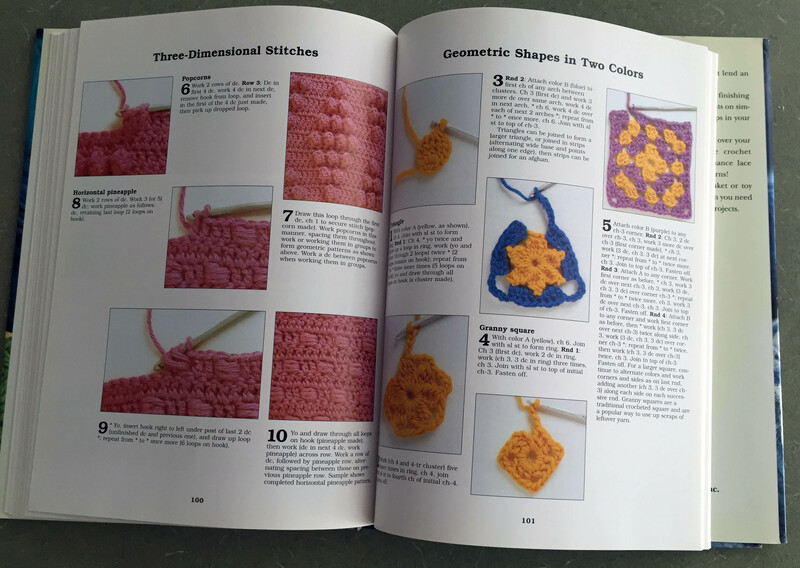 There are approximately 30 pages of how-to’s including a few finishing and simple crochet edgings.They are much better than photos. 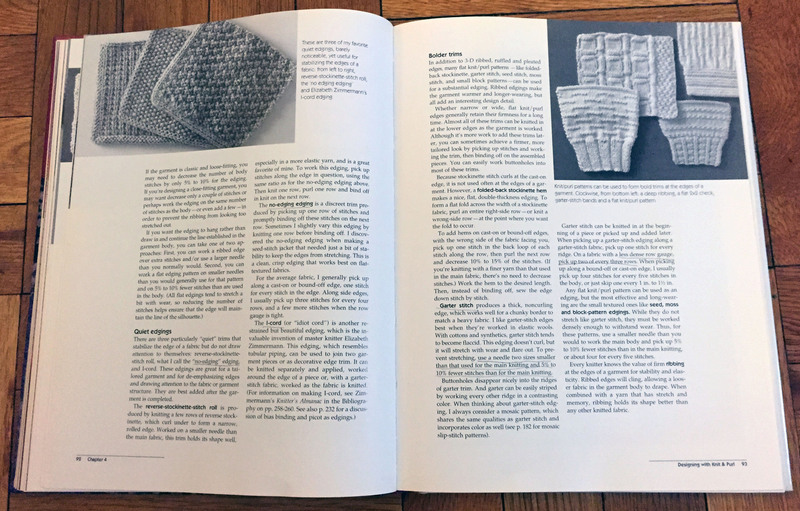 The above page shows weights of yarn used in the book. 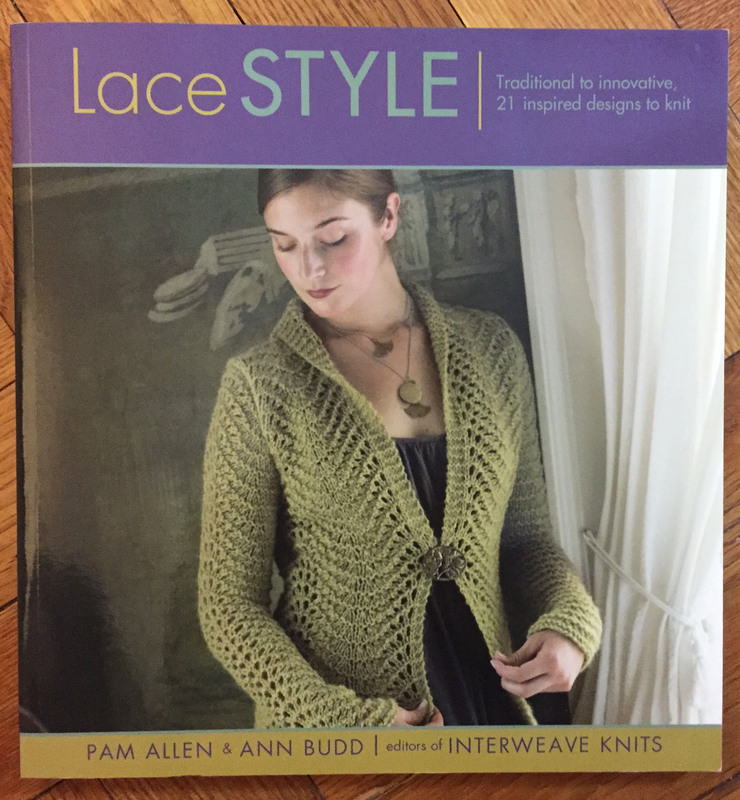 If I had one complaint about the book it would be that only heavier yarns are included. The lightest weight is a heavy worsted. On the other hand, the projects are quicker to make. 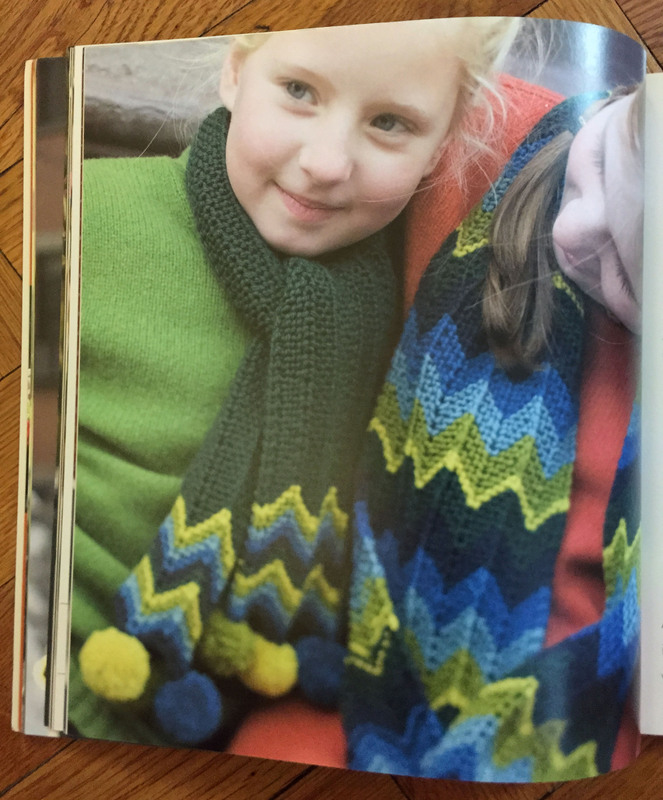 Many of the designs are made with variegated yarns that a perfect for newer knitters. All the projects are photographed on mannequins that keeps the book from becoming dated. 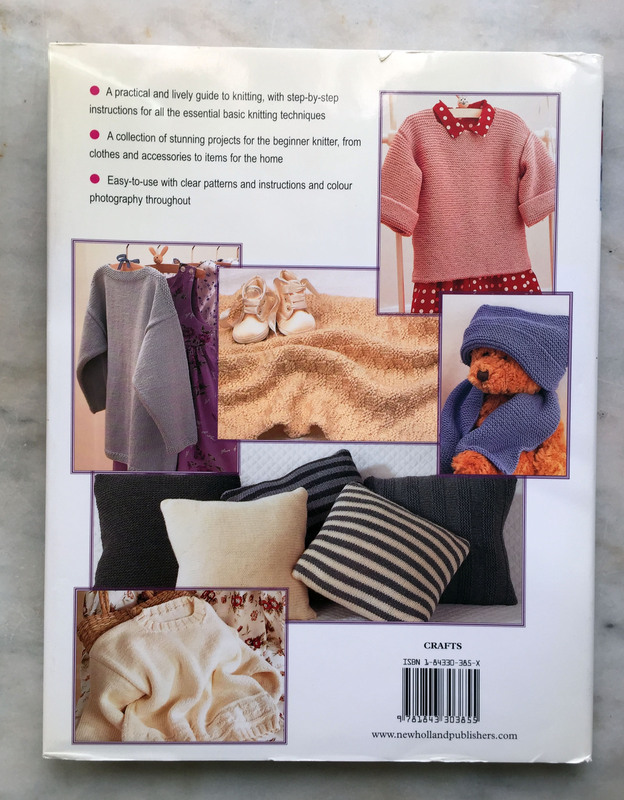 The pattern instructions and schematic drawings are also clear and easy-to-use. My favorite project! Would make a nice present for someone. A few accessories and home dec pieces end the book. Well done Julie and Jordana! The whole chapter today is on breeds of sheep broken down into five categories. By the time I got from page 38 to page 78, I was introduced to more breeds of sheep than I ever imagined existed. Clara has broken them down from the finest fleece to the most course. The chart on page 40 gives a good overview of all the breeds covered in the following pages. There are 37 types of sheep. Many were breed from combos of other sheep to refine the best qualities of the bred sheep. Lots of history throughout these pages. When I first started writing this blog several years ago, I thought I would make a project from each book I covered. Silly me! 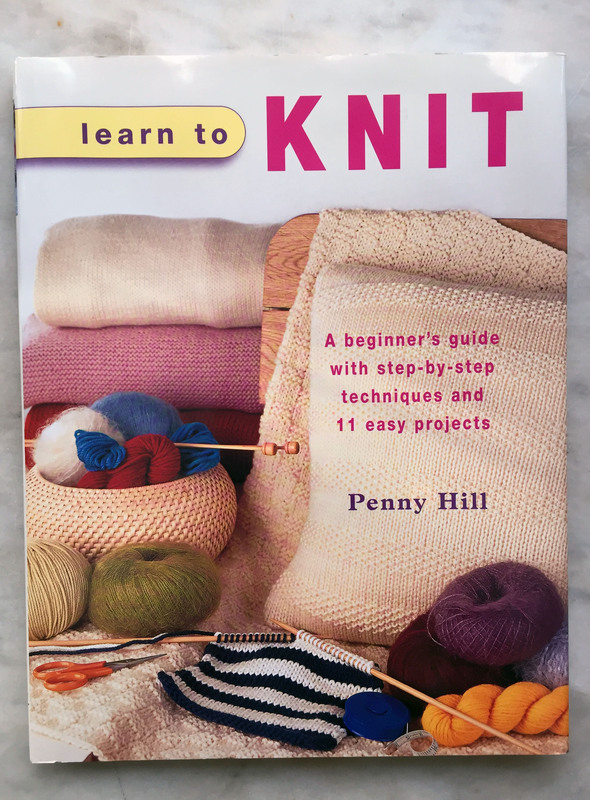 That lasted for one book – The Book of Yarn. When I saw these mitts – I said – why not? I’ll post a pic of my work-in-progress soon. 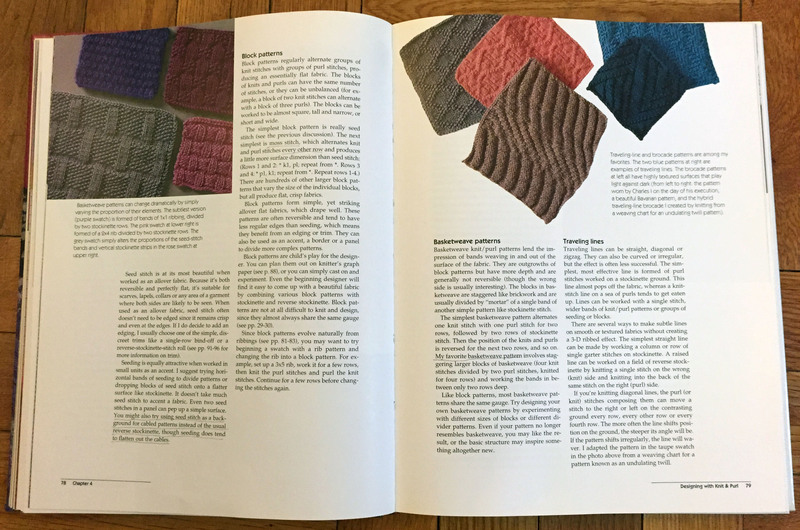 This is an example of a spread from the finewools section. Each breed is discussed, a chart covers the facts and the chart is followed by a lock of fleece and finished skein of the yarn. This reference section makes it worth keeping the book on my bookshelf! 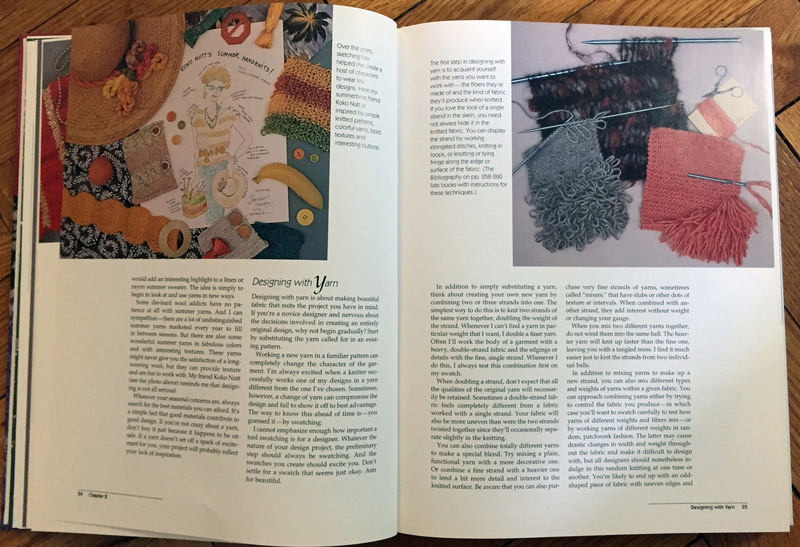 The final page of Chapter 3 features a list by month of various fiber festivals around the United States. There you will see many different sheep breeds. 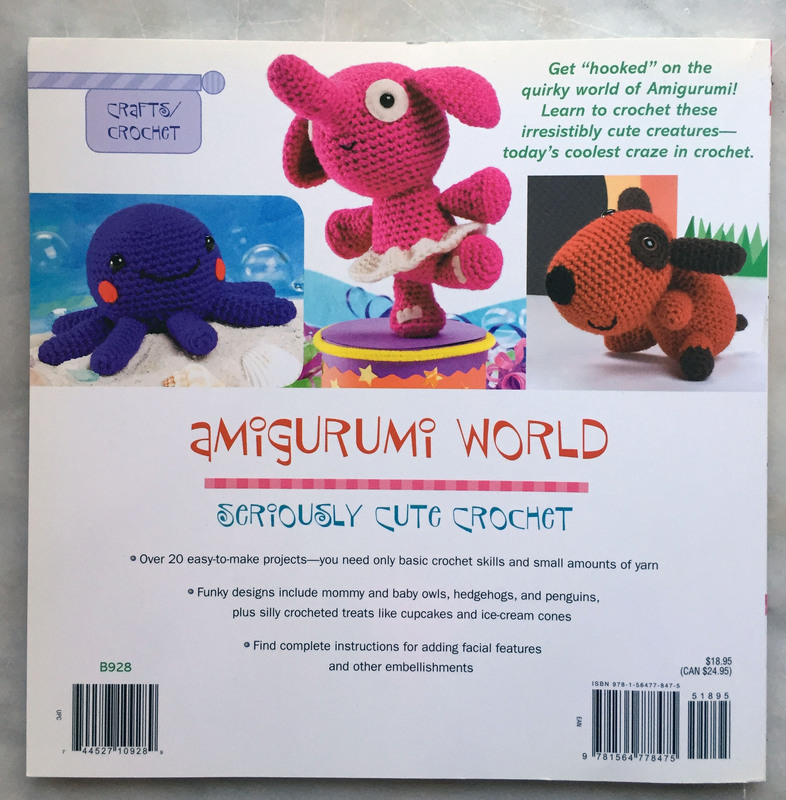 Inside this book I found an email that I had written in 2009 about the book with the sub-title “Seriously Cute Crochet”. In the email (written when I worked for Red Heart), I suggested doing a feature in our newsletter on the book. 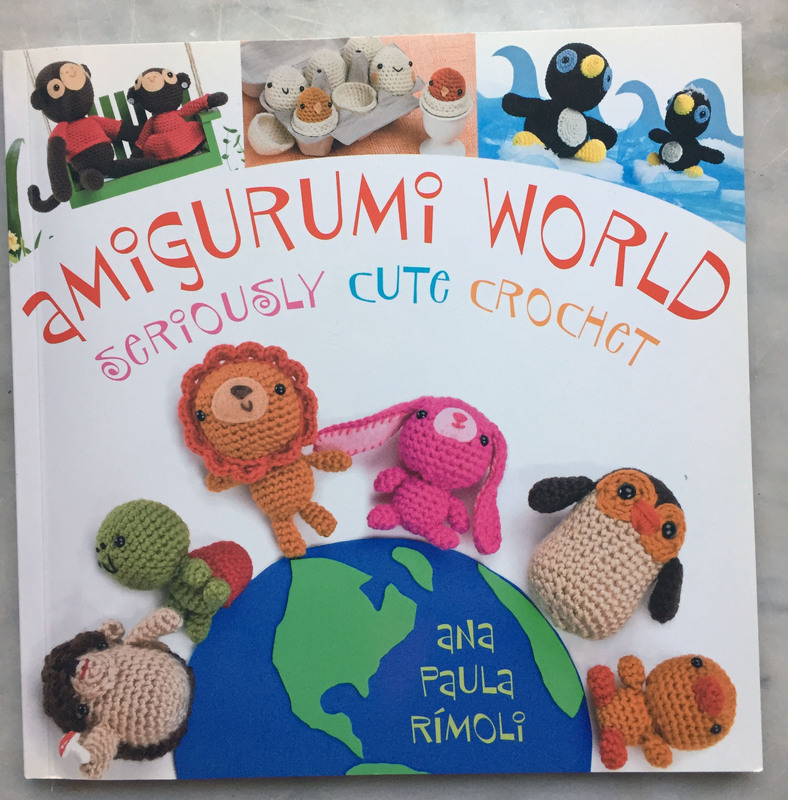 I said that it was full of “so-cute” projects. Now 6 years later, I’m less inspired by the book. 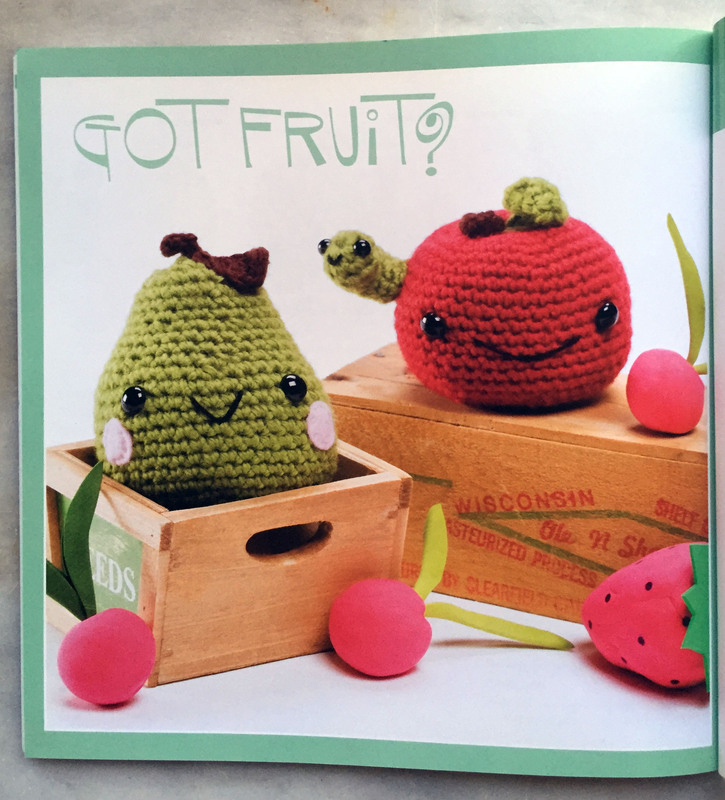 It is still “cute”, but would I make any projects – doubtful. Simply because I’m not going to use the book, I’m giving it a Thumbs-down. The projects are really well-thought out and designed, but I wondered about the $18.95 cover price. You can now get it on Amazon in a Kindle version or a used copy for far less. 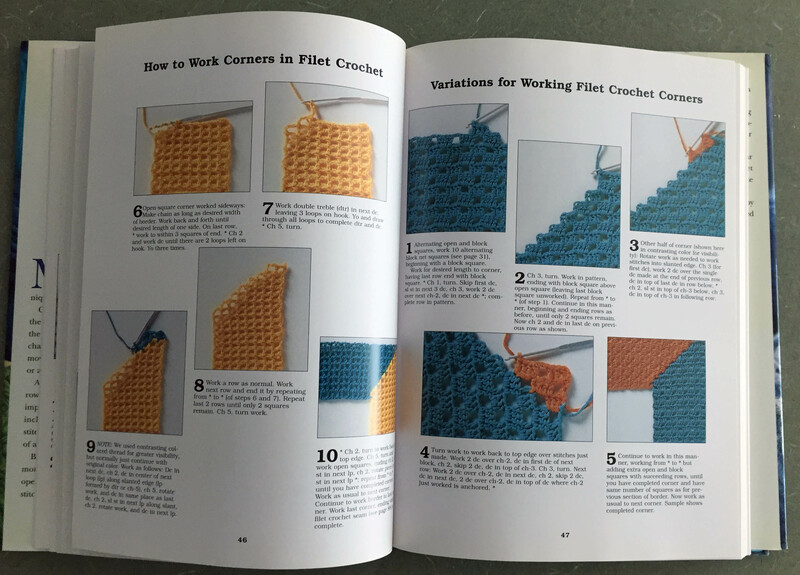 The General Guidelines in this compact book are seriously clear and well-done and would be perfect even for a novice crocheter. 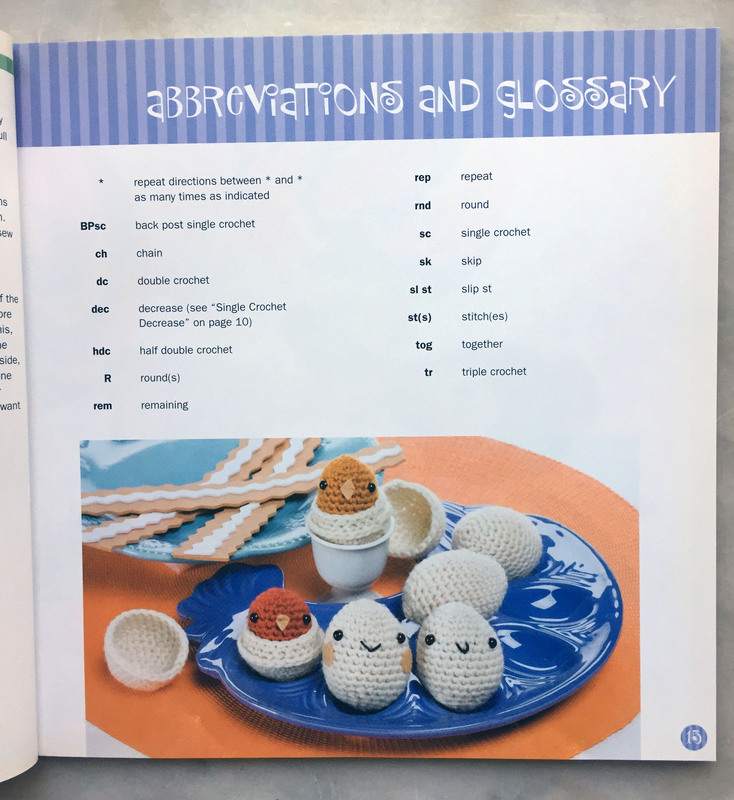 The nice page of abbreviations features a project that I thought to be the “cutest” in the book – Eggzactly! Just one of the projects with easy-to-see photos. When necessary the author has also included back views, especially where animals have tails not obvious in front views. 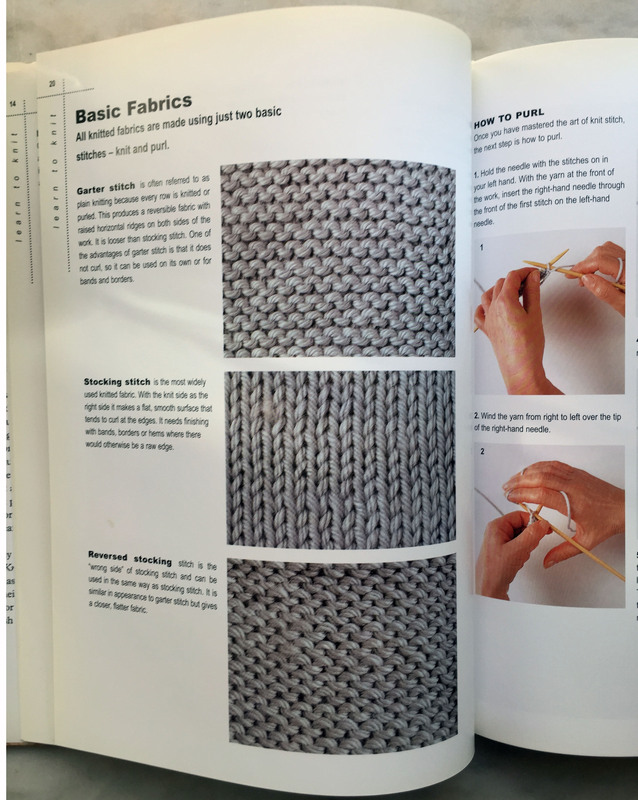 So you might ask – what the H – – – are you doing with a “learn to knit” book? Yes, dear reader, I asked myself the same question. This UK book published in 2003 somehow landed on my book shelf – magically I’m sure! Since it won’t be staying on my shelf much longer and is most likely destined as a library donation, I will at least give it a review here. 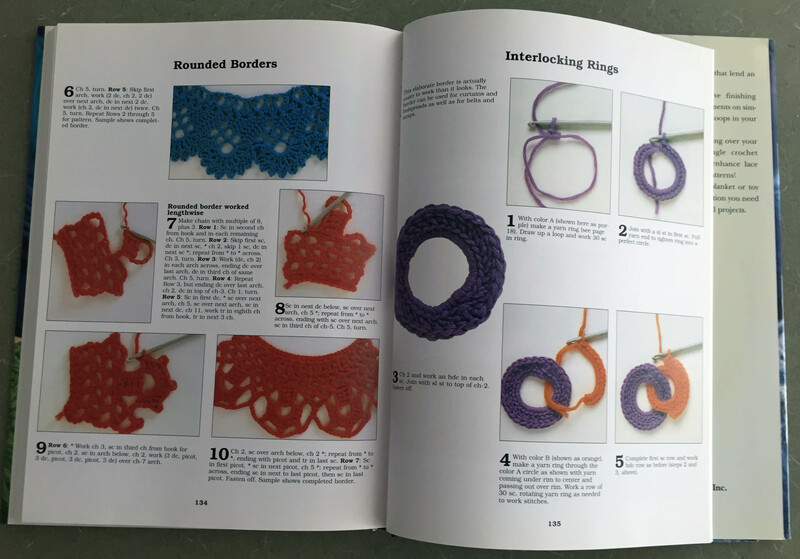 It’s an OK learn to knit book for a novice and covers quite an array of material to be sure. 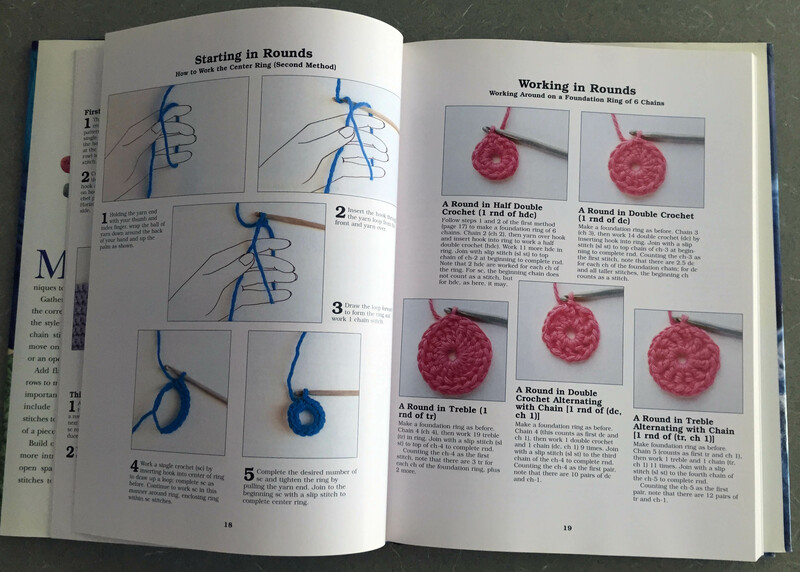 The simple projects shown on the back cover go from easiest to easy with some clarification along the way. 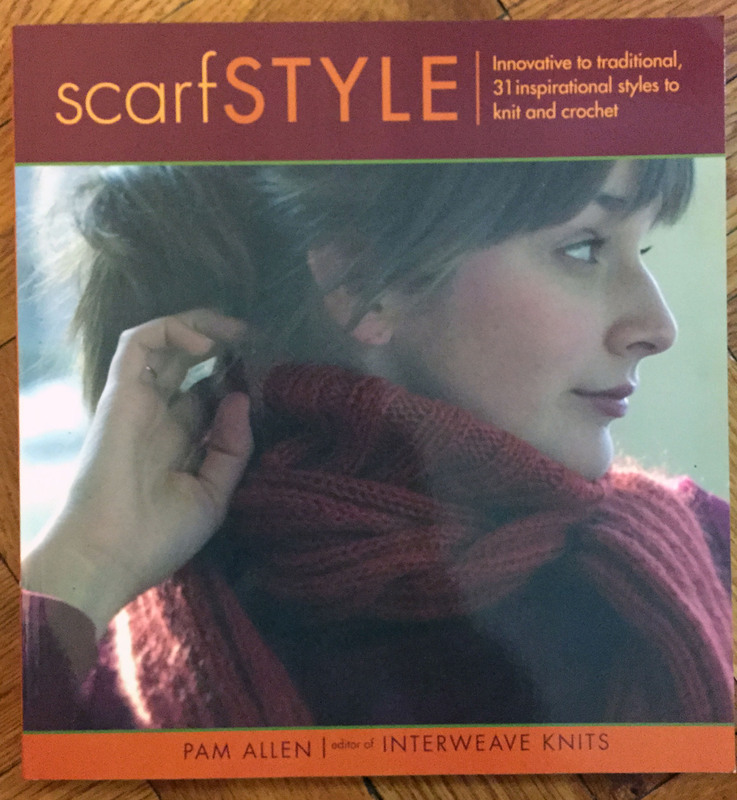 It’s actually a good book for more experienced knitters, if one might be looking to knit simple projects. I’m not usually a fan of photo “how-to’s”, but these are fairly clear. Usually drawn illustrations are easier to follow. 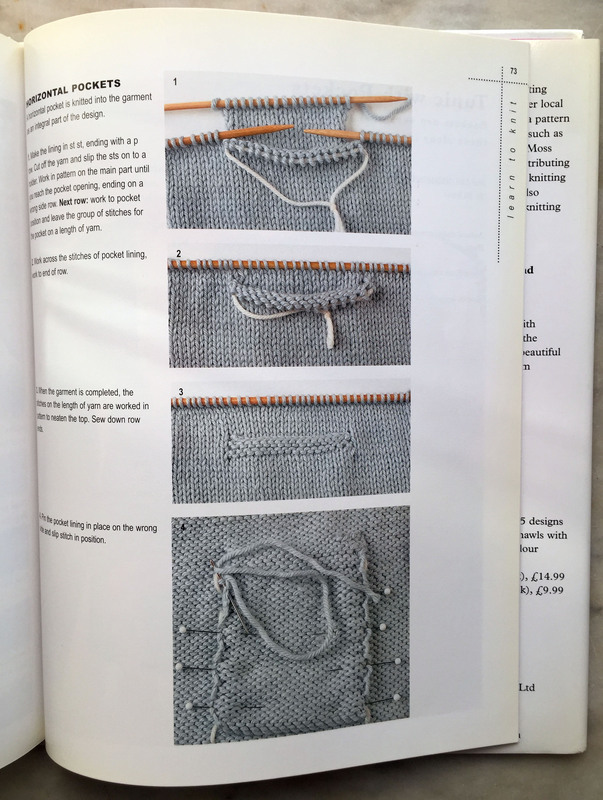 These are clear photos of simple stitches, but the UK version of stocking stitch vs. the US stockinette might be confusing to a beginner. 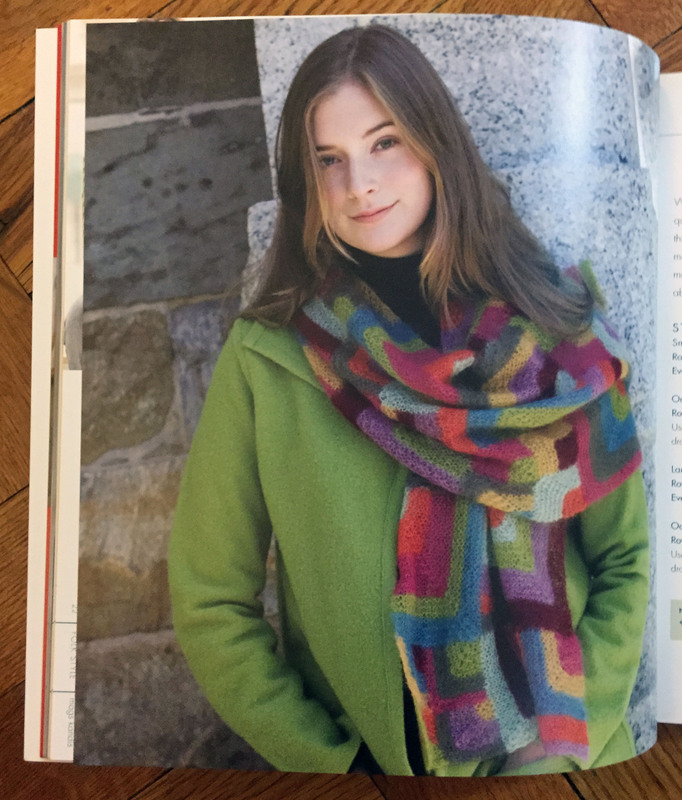 This was a clever way to show what the finished sweater garter stitch pieces will look like and more or less how they will be stitched together. Here’s the finished sweater nicely styled. 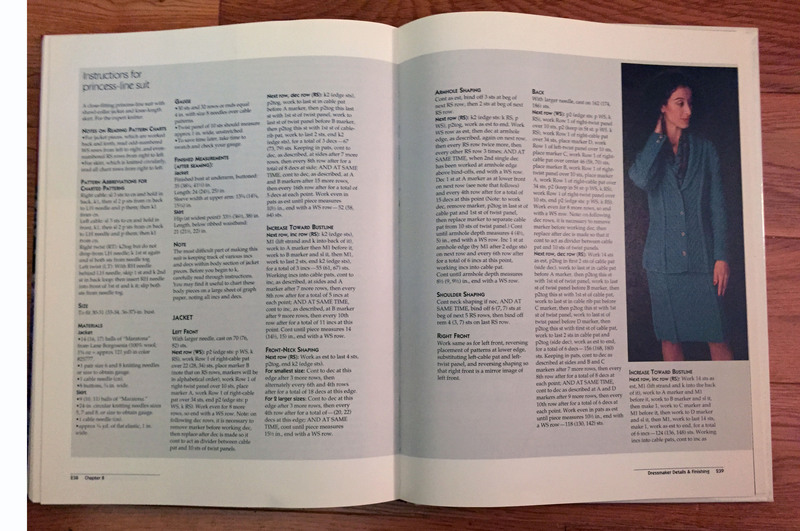 The book uses no live models which probably keeps the book from looking dated. 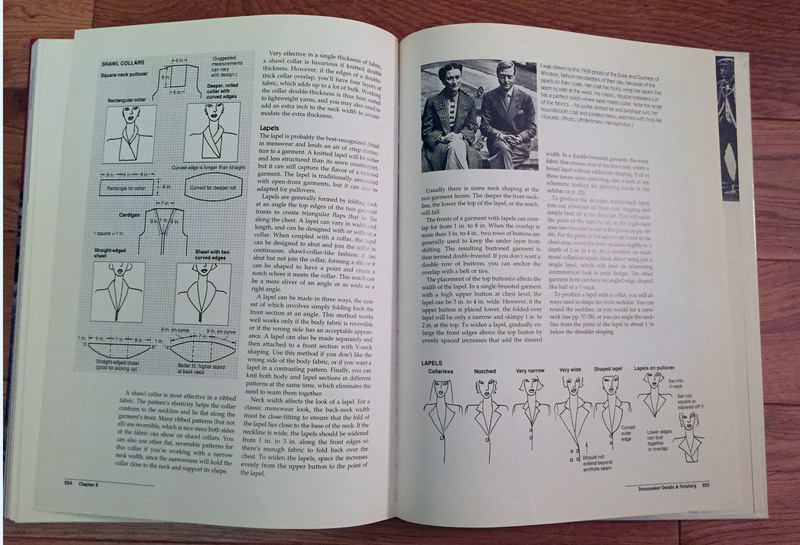 Towards the end of the book, this technique plus several others such as buttonholes makes the book more valuable in the long run. 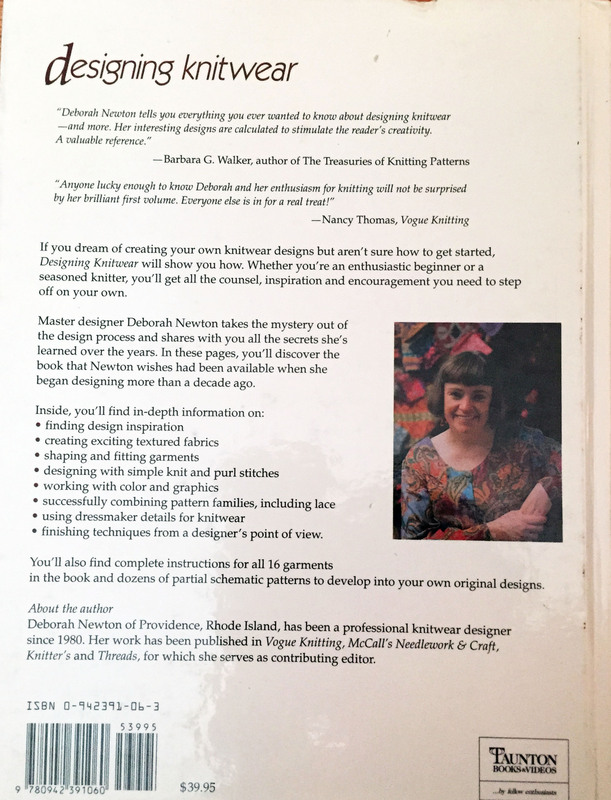 Designing Knitwear – THE END! Even in the last chapter of Dressmaker Details and Finishing, Deborah gives us so much information that this chapter could almost be a stand-alone book. 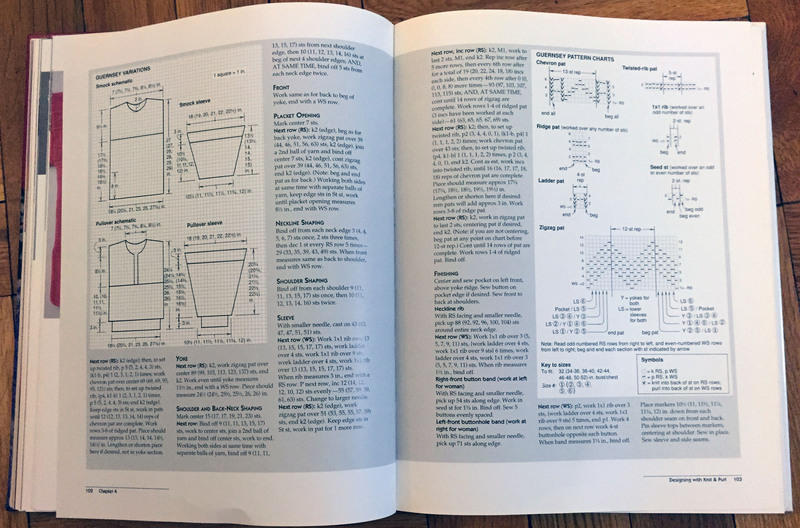 I’ve come to realize in this journey of a comprehensive design book that I might not use the book of a whole, but there are so many nuggets of fabulous info that are great for reference. I would not advise anyone to do what I did – read the book from cover to cover – even though I did break it down into small approachable chapters. 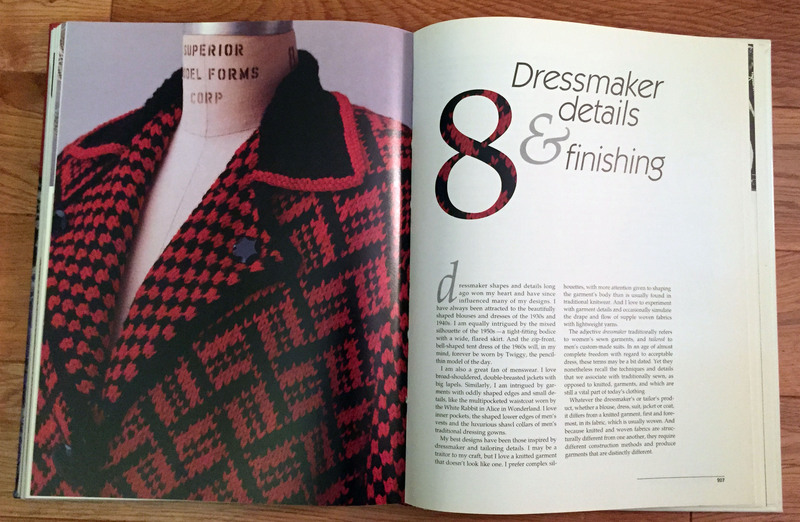 I’m including a couple of photos of pages with collars and lapels. 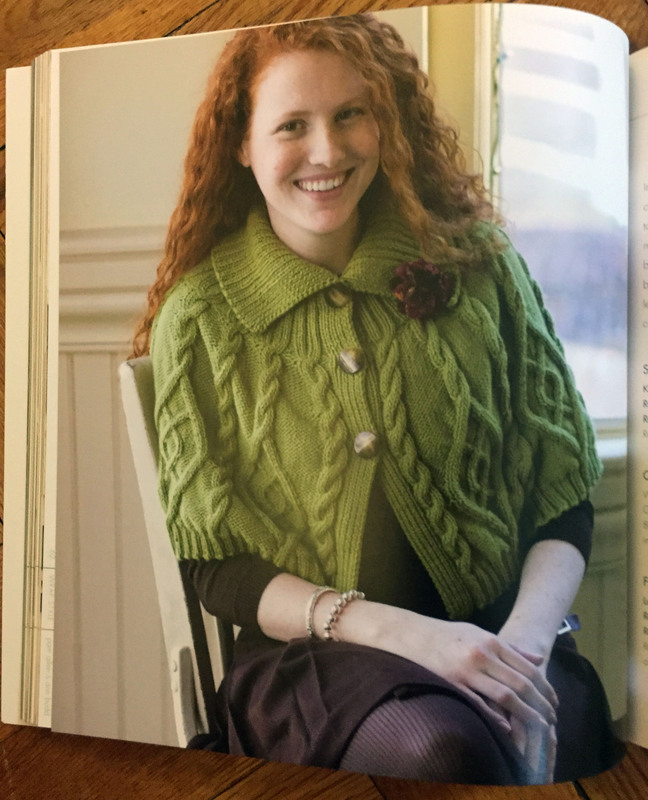 Also covered in the chapter were silhouettes, using ribbing to shape, draped necklines, pockets and cuffs. Oh, and there is a box explaining short rows. Didn’t I say that this chapter could be a book! This page on how to full or felt alone is worth the book. Who knew that adding baking soda to the water to soften it? The fitted suit that ends this chapter isn’t my favorite project, but I admire what it took for Deborah to design it and fit it onto a real model. 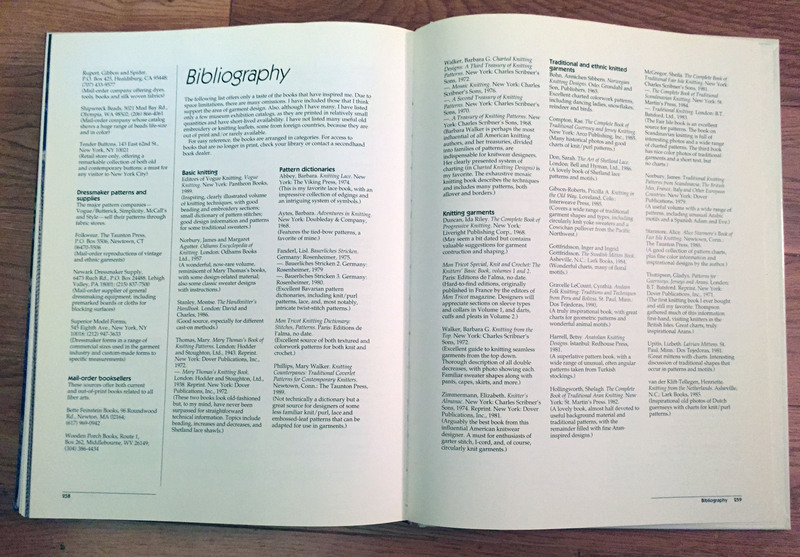 The spread at the end of book has a great list of books to find more information that Deborah refers to throughout the book. 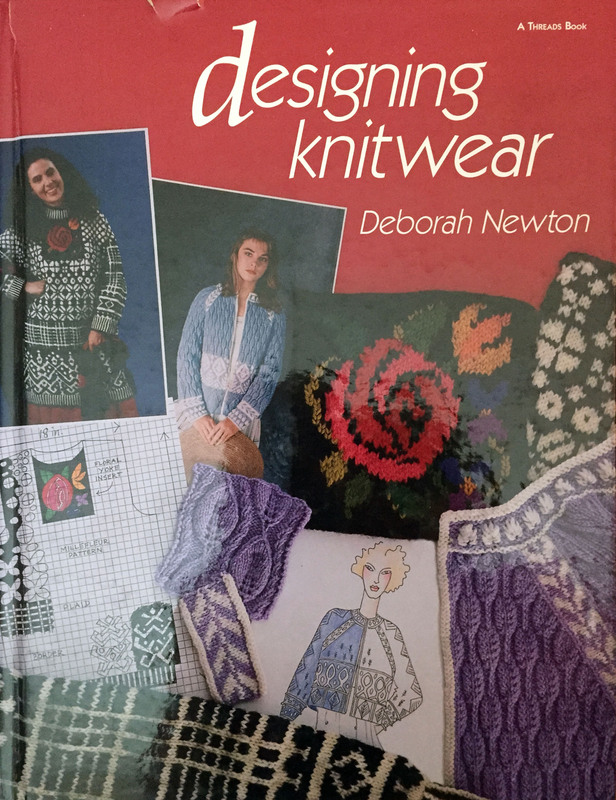 That said, many new books have come into the knitting scene since this book was published. I know there is a newer version of the book and I don’t know if the bibliography has been updated. 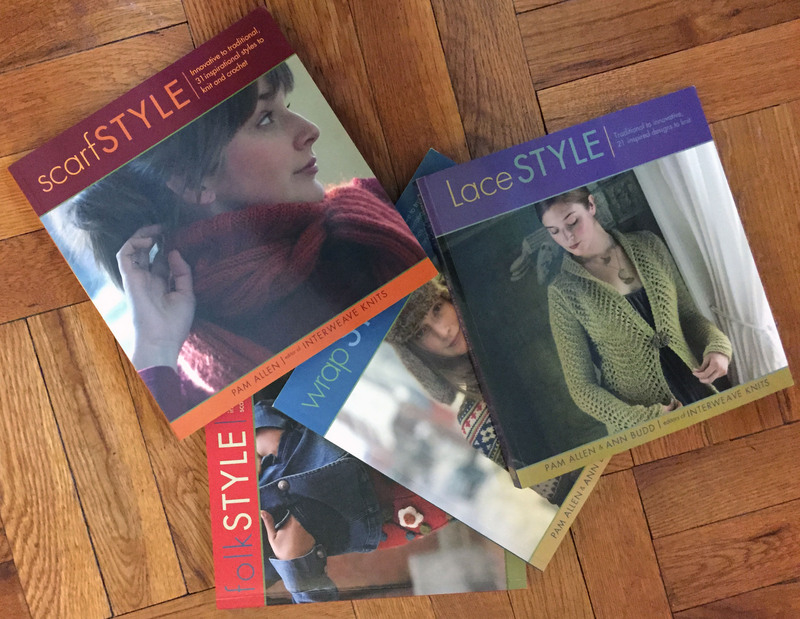 Goodbye Designing Knitwear. My next blog will be with a much easier to read/cover book. 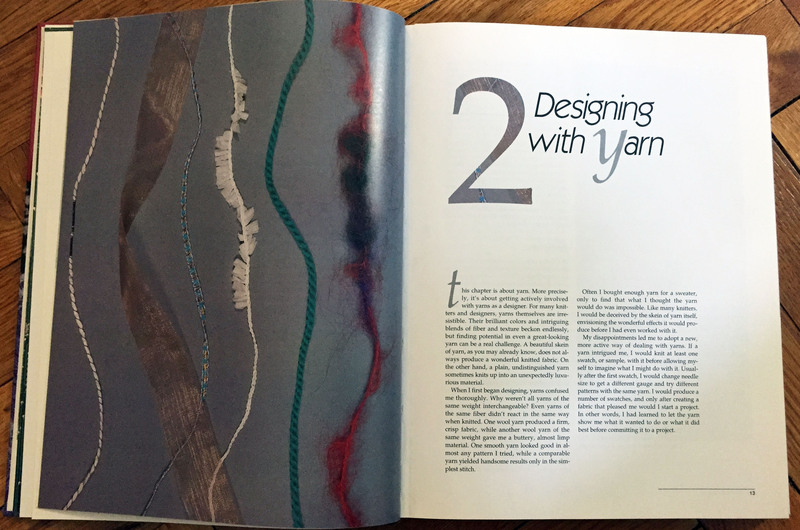 Who knew that there was so much to say about Knit & Purl stitches. Deborah has an amazing amount to cover in this chapter. I was blown away! This chapter is worth the whole book. 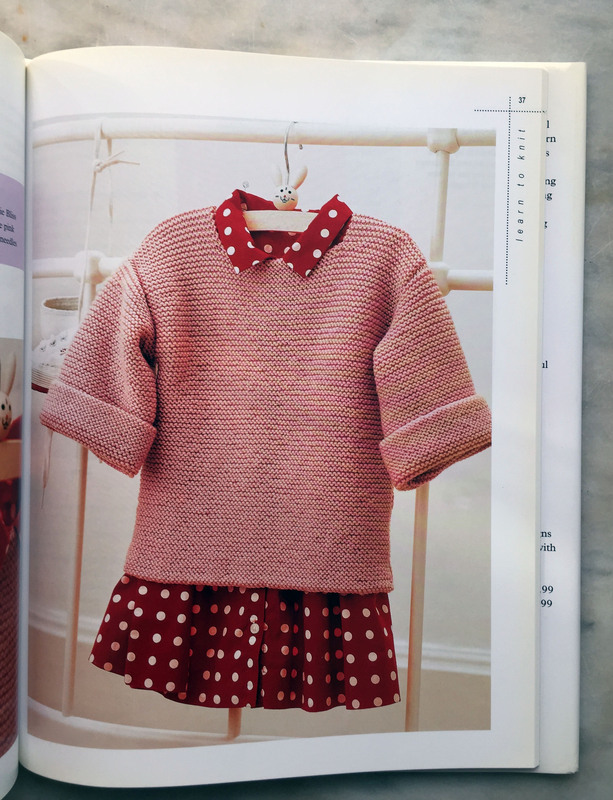 I love the knit/purl one-color designs. She covers lots of variations and most importantly how to incorporate them into designs. 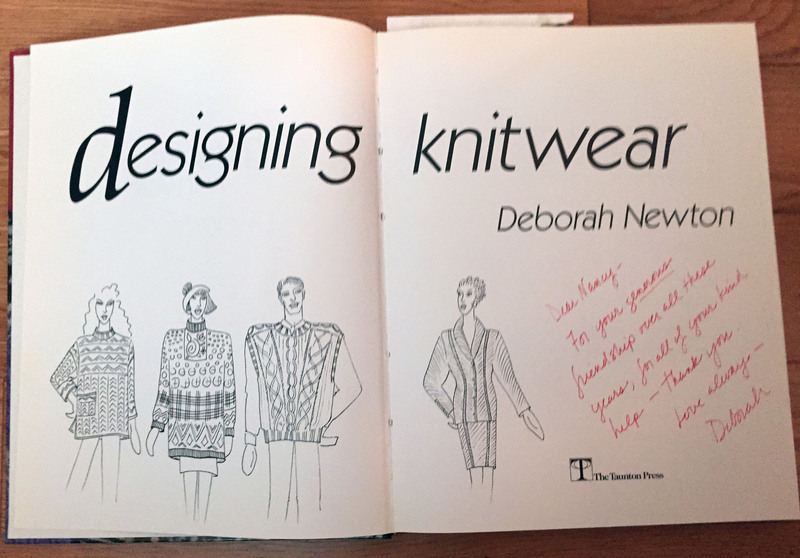 I was happy to see that Deborah included my favorite basket weave pattern (pink swatch on lefthand page). There are lots of combos of simple knit and purl stitches. 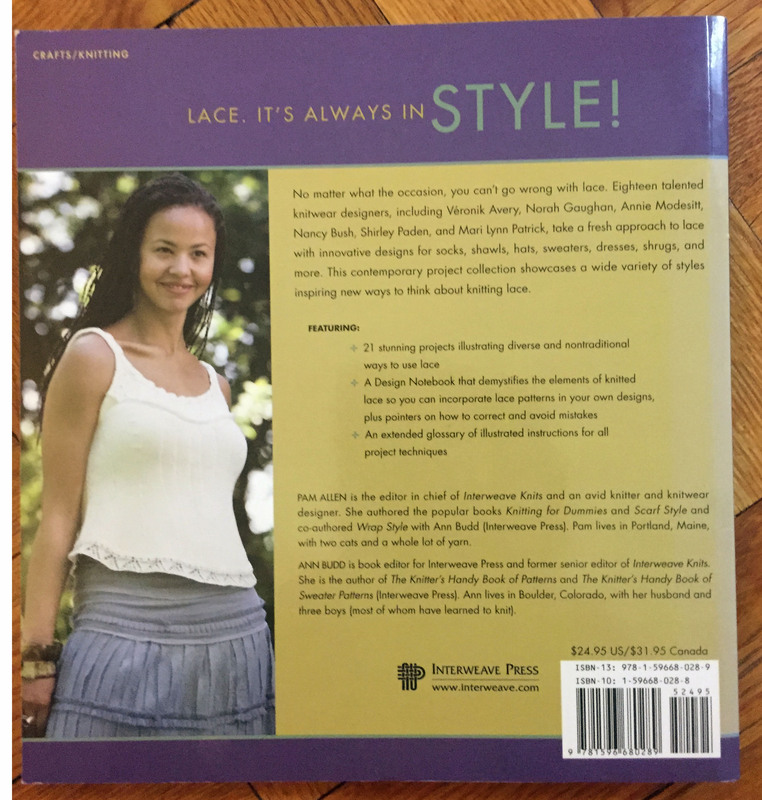 Once you master the basics, Deborah walks the reader through the steps to insert the pattern stitch into a design. This worksheet is a terrific tutorial to learn how to place patterns. Deborah is the master of creative edgings. I don’t think I’d ever heard of the “no-edging edging” until I met Deborah. It’s brilliant! She lists it under “Quiet Edgings” – makes sense. 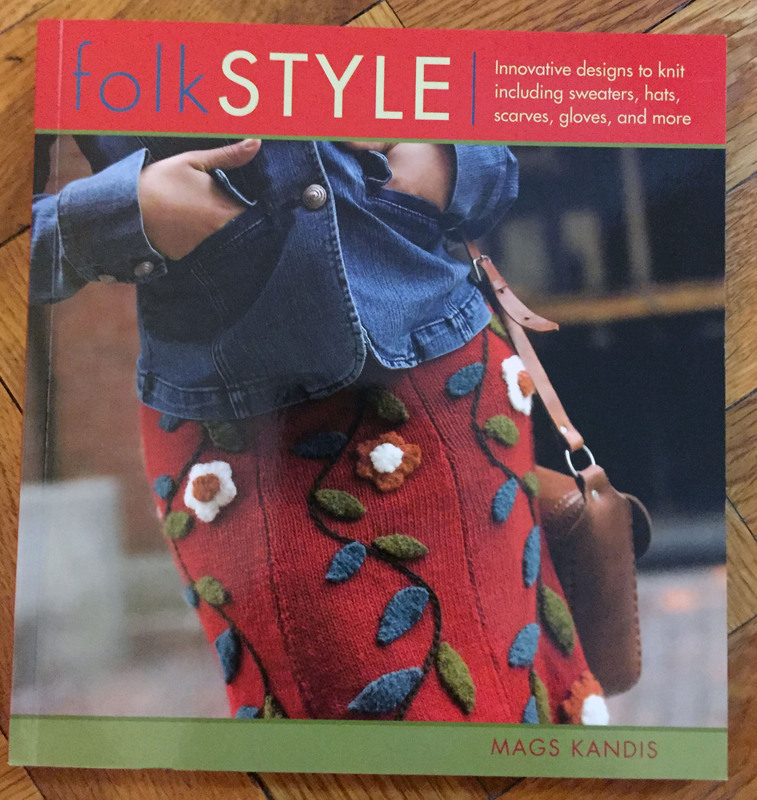 Seems like she could have done a complete book on edges on knits. 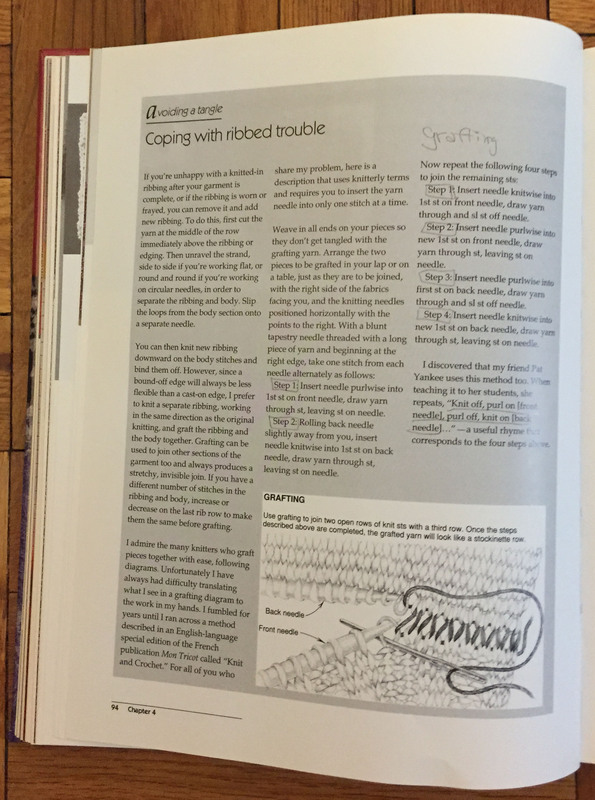 When I started reading the page titled “Coping with ribbed trouble”, little did I know that it was going to be a really good tutorial on grafting. 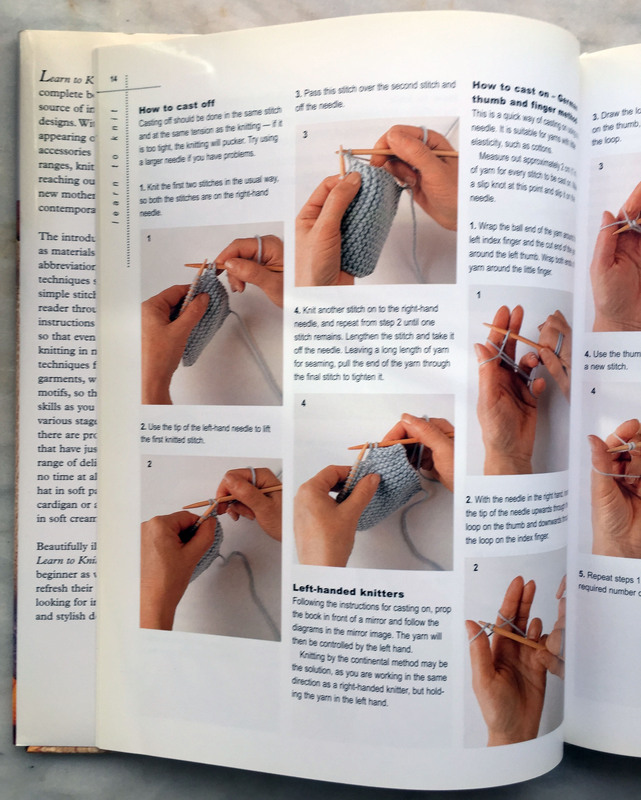 I always have to pull out my VK Ultimate Knitting Book to graft. 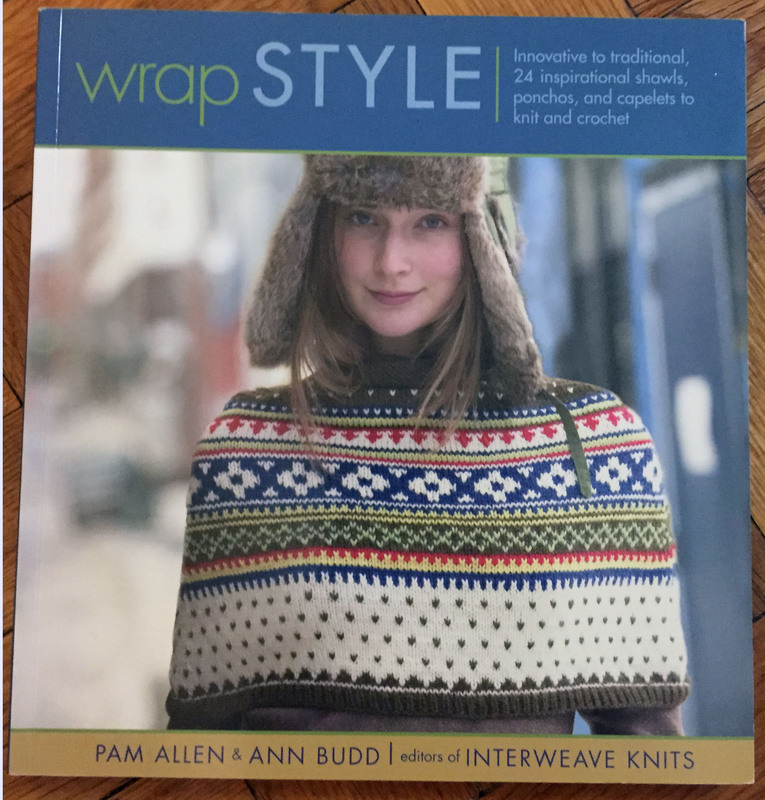 Now that I know, I can pull out Designing Knitwear (page 94) to graft my next project! 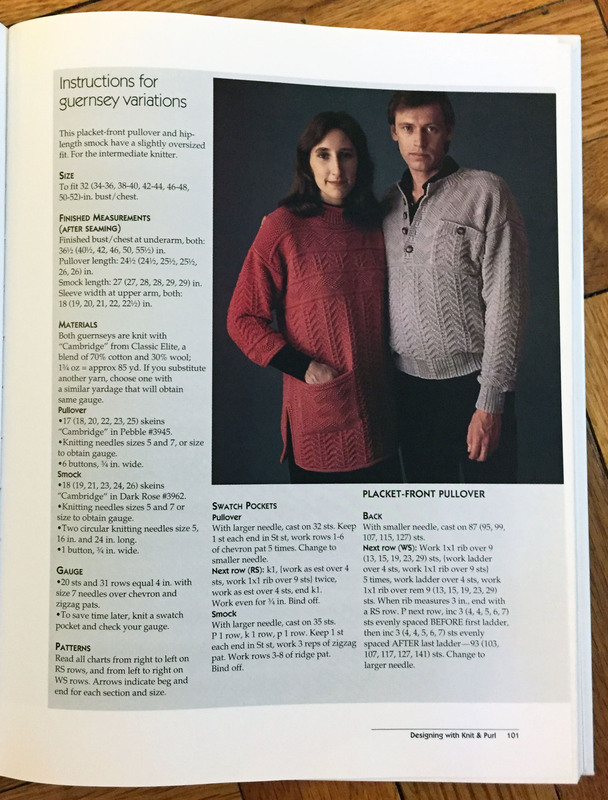 The chapter ends with two Guernsey Sweaters. The tunic style seems a bit dated, but with the knowledge I’ve already learned, I could alter the design and make it shorter. 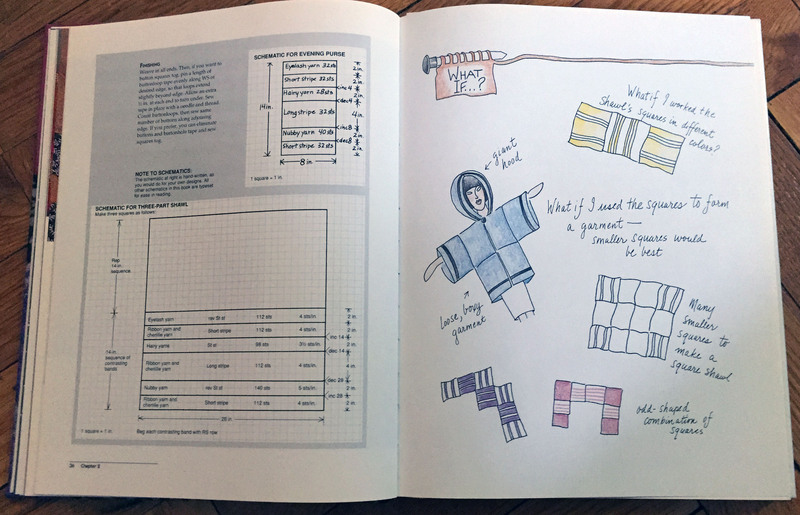 The final pages have the well-written pattern complete with schematics and charts. Now on to Color and Graphics. 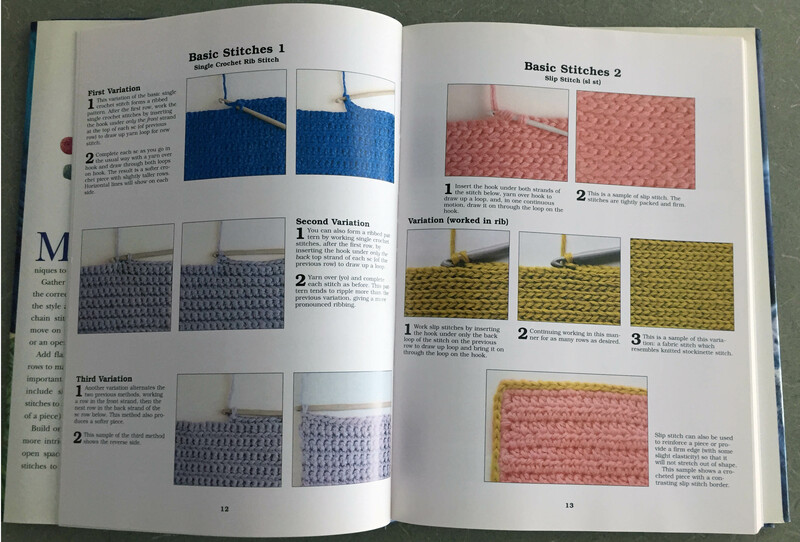 Chapter 5 is about 40 pages, but I’m not so much into color knitting. I’m hoping Chapter 5 will change my mind! 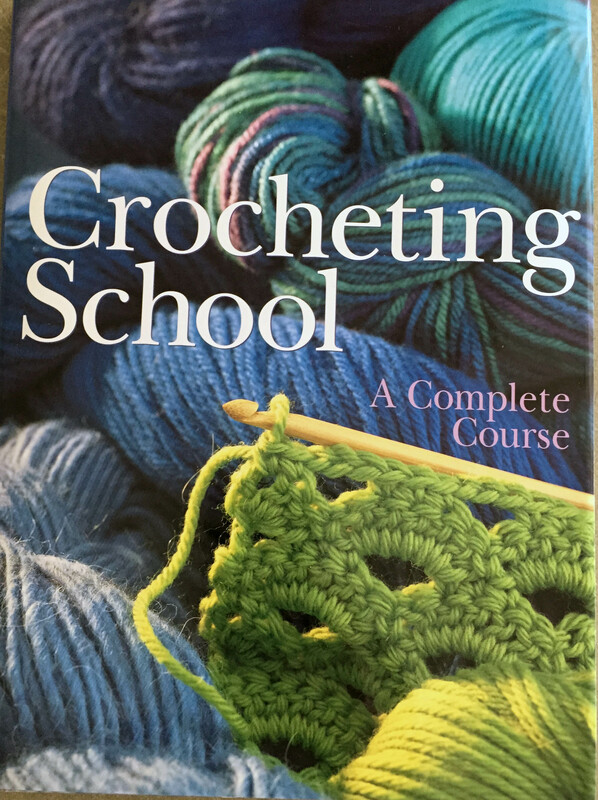 Crocheting School has no author listed. It is a Italian translated book published by Sterling Publishing in 2002. What did I think? I’ll give this one a thumbs up (with reservations). I admit that I always like drawn illustrations of techniques rather than photos. Photos of the finished stitches are fine, but it’s sometimes hard to understand how-to’s from photographs. It’s pretty clear that this book has a European slant and would be bit difficult to use for a real novice. 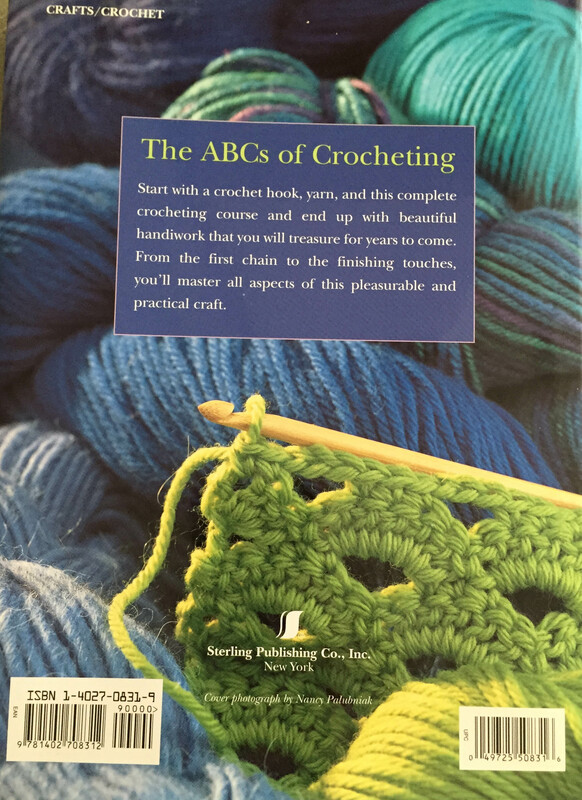 I would suggest it for a learn-to-crochet, but overall it has redeeming value that I will discuss later. Notice the clever use of illustrated hand holds with photographs of yarn. I thought this was a very interesting way to show a technique, but didn’t go quite far enough. 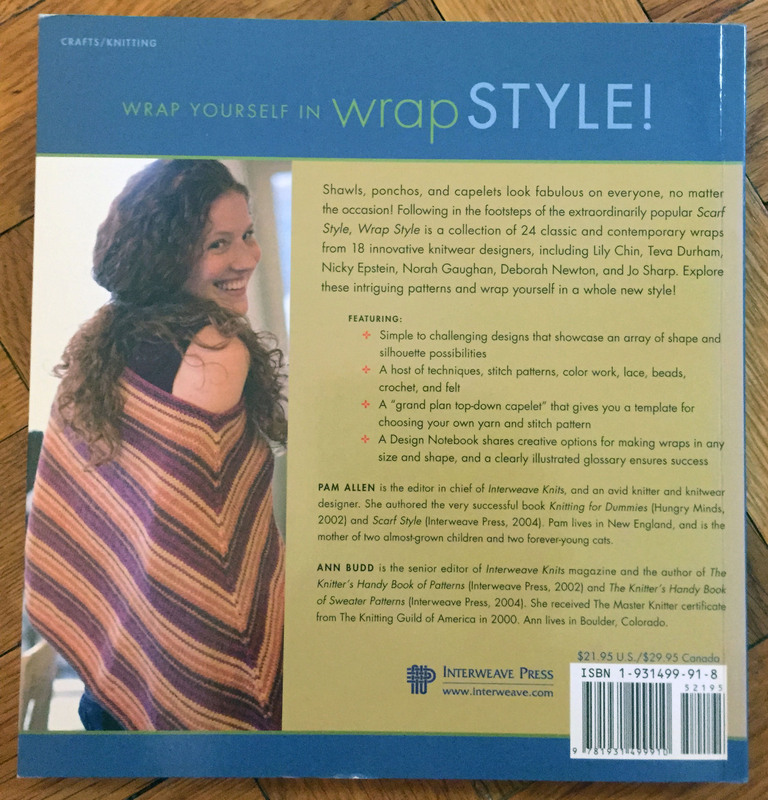 I kept looking for the two American favorites – Granny Squares and the Ripple Stitch. I found the Granny, but not the Ripple. 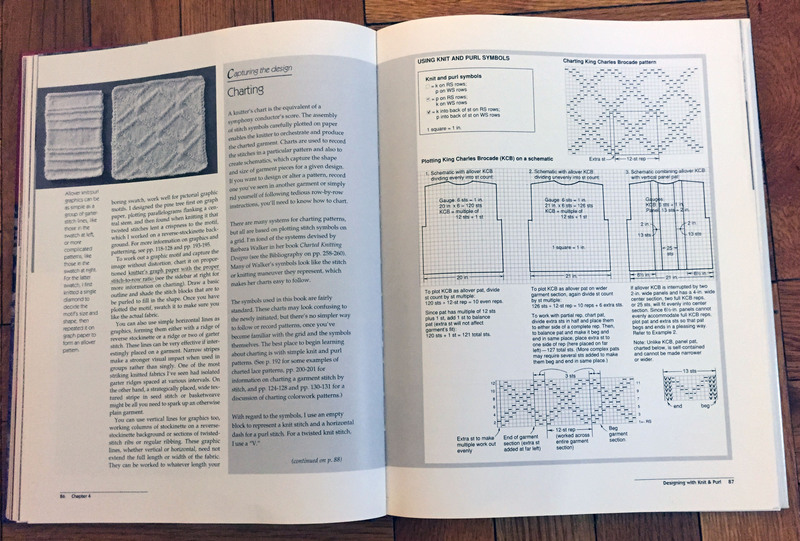 The section on edgings is very good, although we would probably not use the term “trims”. This is a new technique to me and is one of the reasons that I gave this a thumbs up. I would definitely refer to this type of explanation. Another clever technique that I might use in the future. 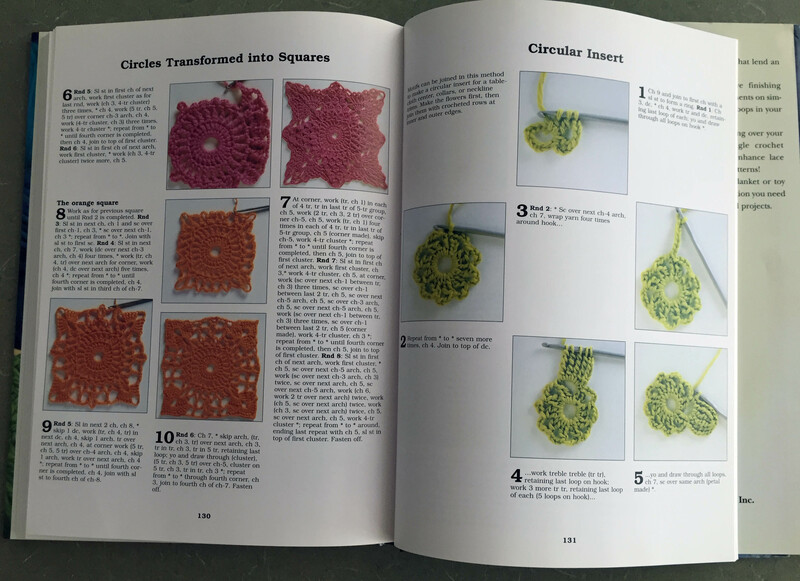 Circles into squares – this is a real basic for granny square lovers. These circles/squares are a bit more advanced. This gives me another reason to keep the book!